I first read about Grindhoue in the July 21-27 issue of NOW, 50 Best Burgers, they were number eleven. As you may know I am on a mission to try every Burger from this listings so as of today; 4 down, 46 to go! The restaurant is buried in tourist trap hell, we were actually out on the opening day of TIFF so that made this venture down to King West even more irritating. But I was not going to let the stupid star gazers get in my way of finding and eating an amazing burger. When I first walked in, I was a little taken back by the lack of ambiance, the walls are fairly empty, the ceilings high and the tables spare. There is a stage area at the entrance side of the restaurant that looks very out of place. On the up side we were greeted right away and sat at a clean high top table by the bar. Our server was quick and friendly, she recommended beer to me as they didn’t have my go to Tank House, I had a pint of Amsterdam Boneshaker IPA – excellent choice, extremely hoppy but just up my alley. NOW onto why I ventured out to the Grindhouse, the food. The food that almost makes up for the lack of ambience. I ordered the Spanish Fly, and I did fall I love as the menu claimed I would. The Spanish Fly One Bite and you will fall in Love! Chorizo minced with House Beef , La Bomba Hot Salsa, Manchego Cheese. Shawn ordered The Wild Boar House Minced with Hazelnuts and Sage, Apple and Onion Chutney, Roasted Garlic Goat Cheese and Baby Arugula. Both were mind blowing amazing. The meat is ground daily and it makes a real big difference, my burger melted in my mouth, to date is the best burger I have ever had. The fries were good but the onion rings could use some work, too much batter. 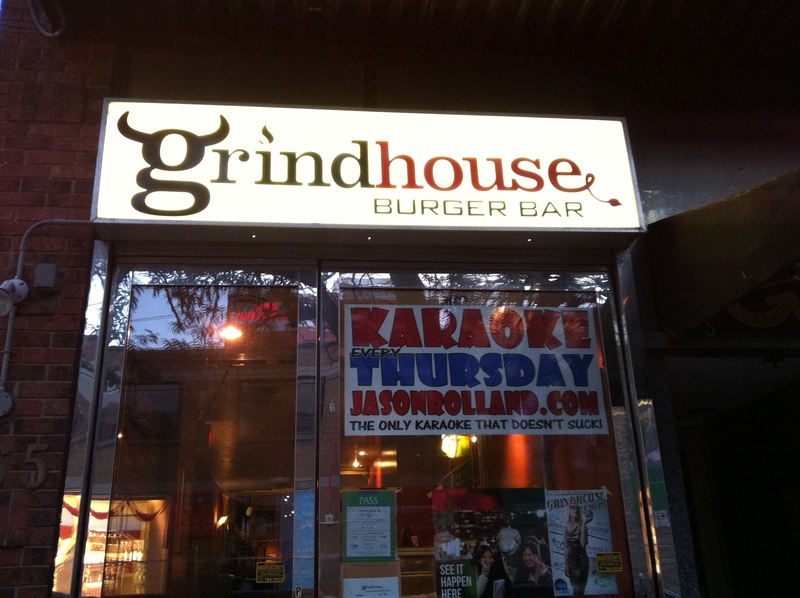 If I were just rating Grindhouse on their burgers it would have been perfect eating experience. PS. Thanks ghburgerbar for the RT, I hope you follow me as I will be back and blogging about your great eats!